Several areas of Togo's capital, Lome, remained blocked off on Friday after security forces fired tear gas against anti-government protesters. 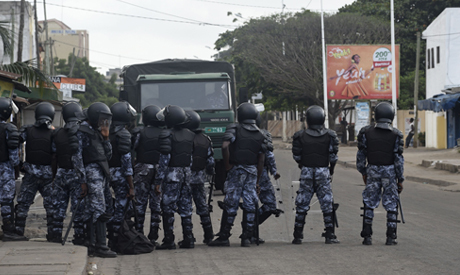 Shops were shut on main roads and in working-class districts of the coastal city, while there was a heavy police presence at main intersections, AFP journalists on the scene said. In the Be area, where there were clashes with police throughout the night according to local residents, youths built barricades with rocks and burning tyres to block traffic. "We want him to leave. We'll stay here until he goes. We're tired," said one of them, referring to President Faure Gnassingbe. Residents in some parts of Lome said they were afraid to leave their homes. One man in his 40s refused to be filmed or give his name, fearing reprisals from the authorities. Columns of smoke from tear gas fired by the security forces could be seen in the sky in several areas of the capital. On Wednesday and Thursday, opposition supporters took to the streets in huge numbers to call for political reform, including a limit on the number of terms the president can serve. Faure Gnassingbe has been president since his father, Gnassingbe Eyadema, died in 2005 after nearly 40 years in power. That led to violent protests in which hundreds were killed. Faure Gnassingbe's election wins in 2010 and 2015 were disputed by the opposition.